Hard Disk Thrashing is when your computer's hard disk activity light stays on, and you hear your disk spinning most of the time, even when you're not doing anything on your computer. When you do try to do something on your computer, it responds very slowly. Something is working your hard disk real hard, and it's not you. When you perform a search on Windows Vista, you can actually search the "contents" of files. Searching files is a very slow process, but Windows can produce the results in seconds. How is this possible? It's possible because Windows keeps a database, called an "index", of all the files on your computer. It's great to get results quickly, but there's a price to pay. The service that creates the index, called the "Indexing Service", has to continuously monitor the files on your computer for changes and update it's database when changes or new files are found. This uses processor time and can take up more than a megabyte of ram. You may notice when just you're sitting in front of your computer, not executing programs or saving files that the hard drive starts working very hard. That might be the Indexing Service working to update it's database. If you commonly search only ceratin folders, you can reduce the amount of work performed by the Indexing Service by configuring the indexing options. Select Control Panel | System and Maintenance | Indexing Options and in the "Indexing Options" dialog box remove any folders that you rarely search from the index. If you rarely use Windows Search feature, and you find it anoying to hear your hard drive working very hard when you're not performing any drive intensive tasks, you can disable the Indexing Service. 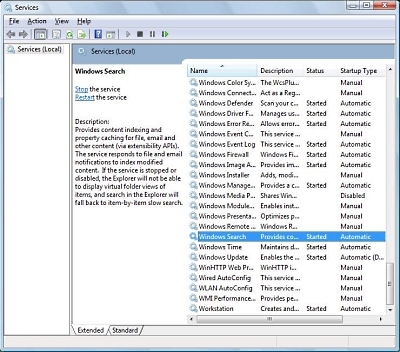 To disable Indexing Service, Select Control Panel | System and Maintenance | Administrative Tools | Services. If the User Account Control dialog box appears, click on the [Continue] button.